We finished giving our pitch on stage (and on a live online feed) to thousands of fellow developers and designers, as well as the media, judges, and the general public. Rick did an excellent job describing the appeal of the Photo Bot in under 60 seconds while Sophie demo’d the app on stage. 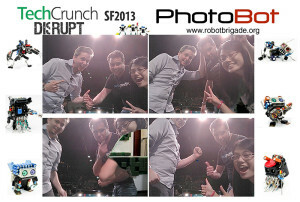 This entry was posted in Events, Projects and tagged Hackathon, Photo Bot on September 8, 2013 by RobotBrigade.